Exchanging messages has become so popular today! Whether you use the Facebook Messenger or Twitter, it is all about messages. But still to-date Email is so popular that Microsoft started convert of Hotmail account to Outlook.com. Gmail and Yahoo are still going great guns! But sometimes things can go wrong when you are working with a pc/laptop/smartphone and it necessarily need not be your fault. Emails can be deleted on purpose or by chance. For example your ex-girlfriend, colleague or enemy can gain access to your Gmail account and delete all your emails. Sometimes hackers can intrude into your email system and create havoc with your data. How to Retrieve Deleted Gmail Messages? If you have created regular Gmail backups you can recover deleted Gmail messages right from Gmail’s web interface. But somehow if you are lazy like me and have no mail backups, you can still recover the lost data provided you meet the following two conditions. 1. Go To your Gmail account and Sign-in. 2. Locate the “Trash" folder on the left side bar. This generally will be below the “Spam" folder. From the email messages available in the “Trash" folder you can select your wanted mails and move them to “Inbox" or any other folder of your choice. You generally need to click the drop-down menu to reach the “Inbox" or any other folder. If you haven’t found your deleted Gmail messages here, you can post a support request on the official Gmail forum as a last resort. 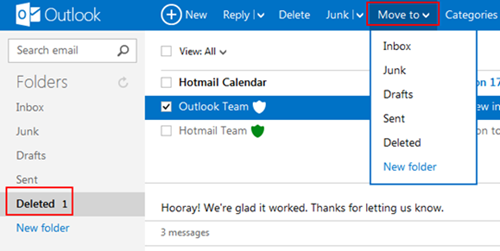 How to Restore Deleted Outlook.com Emails? Just like in Gmail, if you have deleted important emails in your Outlook.com email service you can restore them without any hassle. 1. Login to your Outlook.com service. 2. In the left sidebar/pane of the Outlook.com home screen, you will see a “Deleted" folder. It’s just like the “Trash" folder in Gmail. 3. 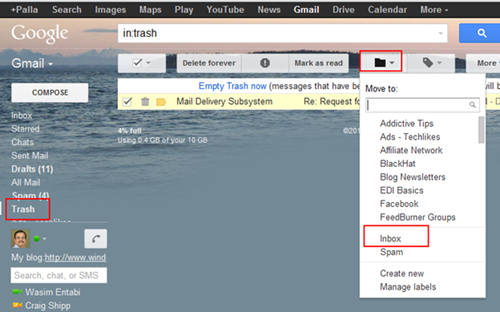 You can do similar tasks as you have done in Gmail “Trash" folder here. As you can observe all the deleted messages are stored in this folder. Just select the email you want to un-delete and click the drop-down on “Move to" tab and choose Inbox. Your deleted message will be back in your Inbox. But there is one more advantage compared to Gmail in Outlook.com. Suppose you have even deleted all the messages in the Deleted folder too, you can still restore them back. This possibility is not available in Gmail. You just have to put a support request in one of the product forms of “Google". Just, click on the “recover deleted messages" present at the bottom on the right side pane of the Deleted folder. Hooray! Outlook.com will try to restore all your deleted messages. Once they are back in your Deleted folder, you just have to move your wanted mails to Inbox as we mentioned before. You will see the above message at the bottom of the retrieved deleted messages, once they are restored. “We brought back every message we could. Please move anything you want to keep since the Deleted folder is emptied periodically. …"
As you observed in Gmail and Outlook.com it’s very easy to get back your deleted messages if you are on a high alert. Sometimes they get deleted permanently and the only chance to restore them back is using support forums and sending a request to the Email service. Guest post by Karri Avinash who is a Microsoft enthusiast with latest tech trendy articles on his blog. He supports his Uncle Palla Ramarao in writing reviews about Windows products like Windows 8, Office 2013, SharePoint 2013 folder Sync, Outlook.com, Windows 7 and Surface tablet. Palla Ramarao, the main writer is a Civil Engineer, Software Engineer and Blogger by part-time.